theme for your candy bouquet. The bags in this post are Valentine-related but "think outside the bag" for other occasions. a bag are candy, wooden skewers, clear tape and foam. floral aisle or fill the bags with spray insulation foam. All of the above-pictured foam came from Dollar Tree. Cut the foam to fit as snug in the bag as possible. might want to consider spray insulation foam to fill the bags. These bags were filled with spray insulation foam. Two are painted, one is not. they are greatly appreciated but inexpensive to make. really good for these smaller bags. You can use smaller skewers to support the smaller candy. These lightweight boxes of candy worked well in the bags also. clear packing tape if you would like. pop off of the skewer. embellished them with stickers from the Dollar Tree. Some of the sticker hearts also got "skewered" and added to the candy mix. These bags were a pack of three for $1 at Wal Mart. Small wrapped chocolates were taped onto long toothpicks to be added to this bouquet. smaller but already had a cute design on them. cost about $3 each (or less). to try a candy bouquet in...it was only $1 and was bigger. top-heavy but it was a lot of bang for the buck. I filled it with spray insulation foam. it blend in with the color scheme...that is optional. I was making this for my daddy. He loves Hershey bars. I taped ten Hershey bars onto larger wooden skewers. evenly as possible to distribute the weight. Push on the skewer and not the candy. you can add basket filler or paper "fluffs". a square. Pinch the center of the paper square into a "stem". "Fluff" the rest of the paper upwards like a flower. Tape the stem. Insert the paper fluff between the candy. about $15 ($1 bag, $3 foam, $10 candy, $1 skewers). 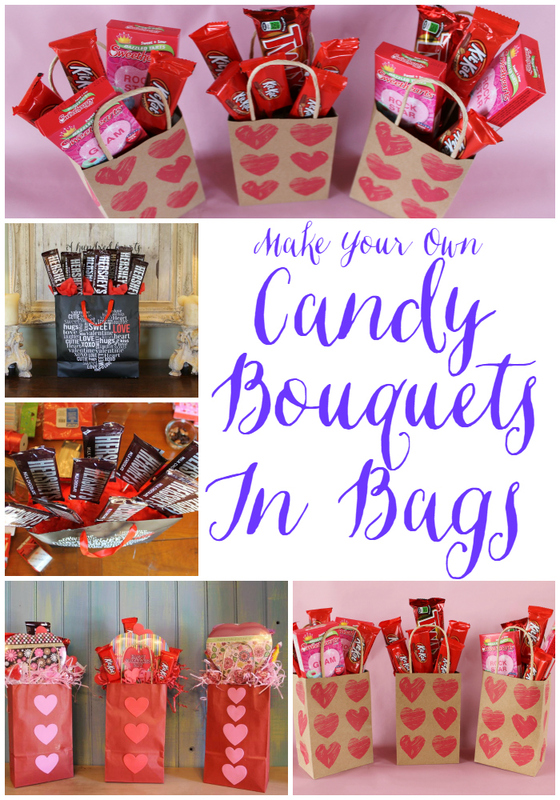 bags to make your candy bouquets in. I promise EVERYONE loves to receive them.
" 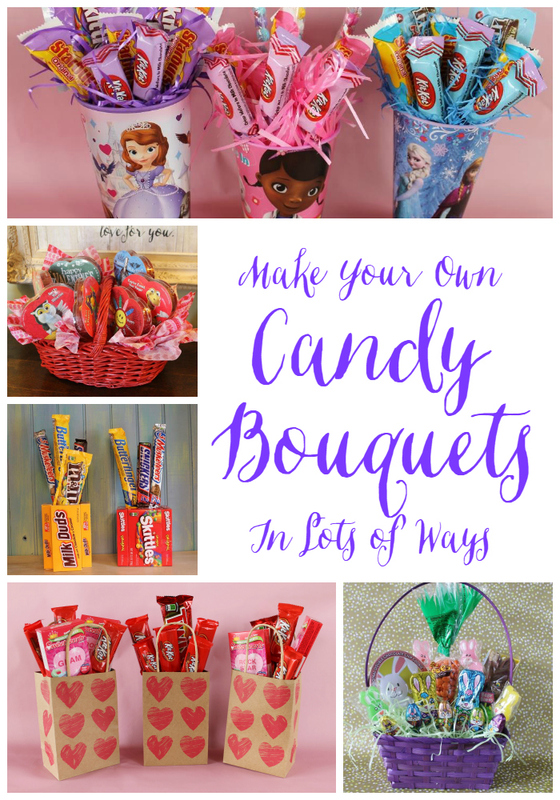 Make Candy Bouquets In Lots of Ways".